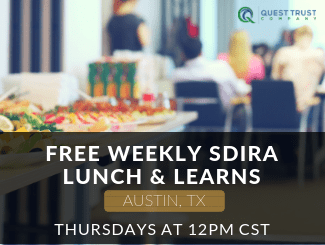 Take advantage of the many FREE educational materials provided by Quest Trust Company, Inc. on our website at www.QuestIRA.com, and plan on attending as many of the live events as possible to network with other self-directed IRA clients. Our events schedule may be found at www.questira.com/events/. You can also call our offices toll-free at 800-320-5950 or 855-FUN-IRAS (855-386-4727) and ask to speak to one of our highly trained IRA Specialists. Happy holidays! H. Quincy Long is a Certified IRA Services Professional (CISP) and an attorney. He is also President of Quest Trust Company, Inc. (www.QuestIRA.com), a self-directed IRA third party administrator with offices in Houston, Dallas, and Austin, Texas, and in Mason, Michigan. He may be reached by email at Quincy@QuestTrust.com. Nothing in this article is intended as tax, legal or investment advice. © Copyright 2013 H. Quincy Long. All rights reserved. The Tax Court ruled in the case of Bobrow v. Commissioner, T.C. Memo 2014-21, that the one-time per 12 calendar month 60-day rollover rule applies to ALL of the taxpayer’s IRAs, and not to each IRA separately. This is in direct conflict with information contained in IRS Publication 590 and in Proposed Regulation 1.408-4(b)(4)(ii). UPDATE: In IRS Announcement 2014-15, the IRS has indicated that it will withdraw Proposed Regulation 1.408-4(b)(4)(ii) and will interpret the 60-day rollover rule in accordance with Bobrow. However, in order to give IRA custodians and trustees time to update their administrative procedures and their IRA disclosure documents, the IRS has announced that it will delay the application of the Bobrow interpretation of the 60-day rollover rule until January 1, 2015. The Tax Court has ruled that Code Sec. 408(d)(3)(B)’s one-rollover-per-year rule applies to allof a taxpayer’s IRAs, not to each of his IRAs separately. Facts. Alvan and Elisa Bobrow, husband and wife, were a married couple who filed a joint federal income tax return. On Apr. 14, 2008, he requested and received two distributions from his traditional IRA in the combined amount of $65,064. On June 6, 2008, he requested and received a $65,064 distribution from his rollover IRA. On June 10, 2008, Alvan transferred $65,064 from his individual account to his traditional IRA. On July 31, 2008, Elisa requested and received a $65,064 distribution from her traditional IRA. On Aug. 4, 2008, they transferred $65,064 from their joint account to Alvan’s rollover IRA. On Sept. 30, 2008, Elisa transferred $40,000 from Taxpayers’ joint account to her traditional IRA. The taxpayers did not report any of the distributions as income. They claimed that they implemented tax-free rollovers of all of the distributions. IRS asserted that the June 6 distribution to Alvan and the July 31 distribution to Elisa were taxable. Background. Generally, Code Sec. 408(d)(1) provides that any amount distributed from an IRA is includible in gross income by the distributee. However, Code Sec. 408(d)(3)(A) allows a payee or distributee of an IRA distribution to exclude from gross income any amount paid or distributed from an IRA if the entire amount is subsequently paid (i.e., rolled over) into a qualifying IRA, individual retirement annuity, or retirement plan not later than the 60th day after the day on which the payee or distributee receives the distribution. June 6 distribution to husband failed the one-rollover-per-year rule. The Tax Court ruled in favor of IRS, that the June 6 distribution was taxable because Alvan failed the one-rollover-per-year rule. The Bobrows asserted that the Code Sec. 408(d)(3)(B) limitation is specific to each IRA maintained by a taxpayer and does not apply across all of a taxpayer’s IRAs. Therefore, they argued, Code Sec. 408(d)(3)(B) did not bar nontaxable treatment of the distributions made from Alvan’s traditional IRA and his rollover IRA. The taxpayers did not cite any supporting case law or statutes that would support their position. The Court said that the plain language of Code Sec. 408(d)(3)(B) limits the frequency with which a taxpayer may elect to make a nontaxable rollover contribution. By its terms, the one-year limitation laid out in Code Sec. 408(d)(3)(B) is not specific to any single IRA maintained by an individual but instead applies to all IRAs maintained by a taxpayer. In support of this theory, the Court emphasized the word “an” in each place that it appears in Code Sec. 408(d)(3)(B). The Court then explained its rationale for concluding that the June 6 distribution, rather than the Apr. 14 distribution, was taxable. When Alvan withdrew funds from his rollover IRA on June 6, the taxable treatment of his April 14 withdrawal from his traditional IRA was still unresolved since he had not yet repaid those funds. However, by recontributing funds on June 10 to his traditional IRA, he satisfied the requirements of Code Sec. 408(d)(3)(A) for a nontaxable rollover contribution, and the April 14 distribution was therefore not includible in the taxpayers’ gross income. Thus, Alvan had already received a nontaxable distribution from his traditional IRA on April 14 when he received a subsequent distribution from his rollover IRA on June 6. Finally, the Court took note that Alvan received two distributions on April 14. It said that it would be inappropriate to read the Code Sec. 408(d)(3)(B) limitation on multiple distributions so narrowly as to disqualify one of the April 14 distributions as nontaxable under Code Sec. 408(d)(3)(A). So, it treated the amounts distributed on April 14 as one distribution for purposes of Code Sec. 408(d)(3)(A). The July 31 distribution to wife was repaid too late. IRS put forth two arguments as to why the July 31, 2008, distribution was ineligible for nontaxable rollover treatment: (1) the funds were not returned to a retirement account maintained for Elisa’s benefit, and (2) repayment of funds was not made within 60 days. As to argument (1), IRS asserted that because she distributed the funds first to the taxpayers’ joint account and the taxpayers thereafter transferred $65,064 from their joint account to husband’s rollover IRA, the July 31 distribution was paid into an IRA set up for Alvan’s benefit and not into an IRA set up for Elisa’s benefit. The Court disagreed with that argument: it said that money is fungible, and the use of funds distributed from an IRA during the 60-day period is irrelevant to the determination of whether the distribution was a nontaxable rollover contribution. In my last article on Option Strategies for Your IRA, I discussed option basics. In this article I will expand on the uses of options and how these strategies might be used to turn small amounts of cash into tremendous wealth in your IRA. Simple Options. The most basic type of option is simply to have an option to purchase a piece of property for a specified price within a certain period of time. This is much better than a loan because it is similar to zero percent interest financing. For example, if a Health Savings Account (HSA) has a five year option to buy a piece of property for $50,000.00, then the HSA does not owe any more for the property at the end of the five years than it did at the beginning, yet the HSA effectively controls the property. This amounts to a five year, zero percent interest loan, but with no unrelated business income tax (UBIT)! You could even structure the option to have monthly or yearly renewal fees, so that it feels similar to a regular seller-financed loan for the property owner. With options all the burdens of owning the property, such as property taxes, insurance, and maintenance, continue to be on the property owner, thereby reducing your IRA’s risk! Fix Up and Sell Options. Many investors are familiar with the typical buy, rehab and resell strategy for real estate. Suppose you created a deal in your Roth IRA where the repairs to be done are the consideration for the option? You and the property owner would agree on a specific list of repairs to be done, and the money for the repairs would come from your IRA. The option price would be based on the value of the property in its current condition. When the repairs are done the value of the property will have substantially increased, but your IRA has an option to purchase the property at the lower price. The value of your Roth IRA’s option is equal to the difference between the current, after repair fair market value and the original option price. As discussed in the prior article, your Roth IRA may, among other choices, 1) exercise its option and purchase the property, 2) assign the option for a fee to a retail buyer and let him purchase the property directly from the property owner, or 3) allow the property owner to sell directly to a retail buyer at a higher price while paying your Roth IRA a substantial fee to cancel the option! Options on Ugly Property. What do you do if you locate a property that you think could probably be sold for a profit, but it is such a trashy piece of property or has so little equity that you are nervous about your IRA taking title to it? The solution is simple: have your IRA purchase an option from the property owner, stick a sign on the property, and try to find a buyer for the property which will give your IRA a profit. Options under these circumstances can often be purchased with very little money from your IRA. Even if your IRA ends up not exercising its option sometimes, overall this can be an incredibly powerful wealth building strategy. Options on Partial Interests. What if there were several heirs owning a property you wanted your IRA to buy, but the heirs did not get along or did not agree to a certain price? Rather than giving up, have your IRA buy an option to purchase each heir’s interest separately. The price would not have to be equal to each heir. Once you have negotiated options with all the heirs, you could add up the price and see if your IRA could market the property for a profit. Low Ball Offers and the Right to Cancel. Suppose you want to make a low ball offer on a piece of property. The seller wants too much for the property, and you think he won’t get his price. On the other hand, he has to sell by a certain date for whatever reason (foreclosure, closing on a new house, moving out of town, etc.). Tell the seller this: “If you sell my daughter’s Coverdell Education Savings Account (ESA) an option to purchase the property for my price, I will give you the right to cancel the option within the next 30 days if you return the option fee plus $2,500.00. That way, if you find someone to pay you more than you would get from me who can close quickly enough you can sell the property to them and cancel the option, but you know you have a guaranteed sale if you can’t sell it to someone else on time.” How’s that for overcoming objections to a low ball offer? Your daughter’s ESA either gets the property at a bargain price or the seller pays her ESA not to buy! Rights of First Refusal. Another technique that can be used either alone or in conjunction with an option is a right of first refusal. A right of first refusal by itself is not an option to buy. It only means that the seller agrees not to sell the property to anyone else before first offering it to the holder of the right of first refusal. This is commonly used in business transactions, and can be used in real estate as well. Sales price and other terms are not typically negotiated in a pure right of first refusal, since it is only the right to buy the property at whatever price and on whatever terms the owner wants to sell. When combined with a long term option, this strategy can pay off even if the option price is as high or higher than the current fair market value. For example, what if your IRA has an option to purchase a property in a growth path area for $100,000.00, and the option has a right of first refusal clause in it. In other words, any time the property owner wants to sell the property to a third party he would have to offer it to your IRA under the same terms. If the property owner wants to sell the property to a third party for $80,000.00, your IRA will also have the option to purchase it for that price because your IRA’s option has a right of first refusal clause. But suppose $80,000 is at or near the current fair market price and so exercising the option is not a good deal for your IRA. Assuming your option agreement is structured in a way that the option does not expire merely because of a transfer of ownership, the new owner of the property will have to take the property subject to that option. This of course limits his ability to sell the property in the future for more than your option price. Also, if a notice of option is filed in the real property records the buyer’s lender may require that the option be released. What is the value of your option under these circumstances, even though it is at a higher price than the current fair market value? The answer is however much the owner and buyer are willing to pay your IRA to cancel the option if that’s what you want! Options and Shared Appreciation Mortgages. Has your IRA ever made a hard money loan and you thought, “I’d sure like my IRA to have a piece of that property! What a great deal!” Here is an interesting concept: loan the money to the investor at a low interest rate in exchange for an option to purchase a certain percentage of the property at the initial purchase price. One investor I know was able to use this method to purchase a property at a discount with a tenant in the property. Because the tenant was already in the property with a long term lease, he could not make the deal work using regular hard money rates. His solution was to borrow the money for the purchase and rehab from a friend’s IRA. The IRA received 6% interest plus an option to purchase a 50% interest in the property at one-half original purchase price. The investor walked away from closing with $3,000 in his pocket, a rental property with cash flow, and 50% of the future appreciation! Another possible structure is a loan with an option to convert from debt to equity. Options on Personal Property. Options are most commonly discussed in terms of real estate. However, there is nothing which says you cannot purchase an option on personal property. For example, in many states the beneficial interest in a land trust is considered to be personal property. You may want to have your IRA purchase an option on a discounted note to see if it can be sold for a profit. I have even heard of people having an option in their IRA on automobiles being purchased by an investor at car auctions. Most people understand that an IRA is normally not a taxable trust and its income is not taxed until the income is distributed (or not at all, if it is a qualifying distribution from a Roth IRA). However, there are 2 circumstances when an IRA may owe tax on its income. First, if the IRA is engaged in an unrelated trade or business, either directly or indirectly through a non-taxable entity such as an LLC or a limited partnership, the IRA will owe tax on its share of Unrelated Business Income (UBI). Second. if the IRA owns, either directly or indirectly, property subject to debt, it will owe tax only on the portion of its income derived from the debt, which is sometimes referred to as Unrelated Debt Financed Income (UDFI). I will refer to either tax as Unrelated Business Income Tax (UBIT) in this article. From a financial planning perspective, the question becomes “Should I avoid doing something in my IRA which may incur UBIT?” Many people just say “Forget it!” when they learn a certain investment may subject the IRA to UBIT. Or worse yet, they ignore the issue and hope they won’t get caught. However, being afraid of UBIT is short sighted and ignores the opportunity it presents for building massive wealth in your retirement plan. Remember, making an investment which may subject the IRA to UBIT is not a prohibited transaction, it just means the IRA has to pay a tax. The best financial advice on UBIT is simple: “Don’t mess with the IRS!” If the IRA owes UBIT, make sure it is paid. “But,” you object, “doesn’t this mean I am paying double taxation?” Unless your IRA is a Roth IRA, it is true that in these 2 circumstances the tax will be paid by the IRA and again by the IRA holder when the income is distributed. However, in my view this is the incorrect focus. Is the IRA glass 1/3 empty or 2/3 full? At least the IRS is a silent partner. The double taxation issue is no different when investing in stocks traded on the stock exchange, since corporations pay tax on income before issuing dividends to shareholders, and the value of the stock takes into account that the company must pay income taxes. Two key questions arise when analyzing a “UBIT investment.” The first question to ask in UBIT analysis is “What tax would I pay if I did the same transaction outside of my IRA?” The only “penalty” is the amount of tax the IRA would pay above the amount that you would pay individually. If you make the investment personally, you not only will pay tax on the income from the investment, but also from the next investment, and the next one after that. At least within the IRA you have the choice of making investments with your proceeds which do not incur UBIT. A second question to ask is this: “Will my after UBIT return exceed what I could make on other IRA investments?” Why should you turn away from an investment in your IRA which will give you an incredible return even after paying the tax? Let me give you one powerful example of how paying UBIT might make a lot of sense. One Quest client purchased a property in her Roth IRA subject to approximately $97,000 in delinquent taxes (this is the same as a mortgage for UBIT purposes). The owner was willing to walk away from the property for $75 just to get rid of the headache and the lawsuit pending against him by the taxing authorities. With closing costs the IRA spent around $3,000 to acquire the property. Only 4 months later the property was sold to another investor, and the Roth IRA netted around $46,500 from the sale after paying delinquent taxes and sales expenses. Because the IRA purchased the property subject to debt (the delinquent taxes), it owed UBIT in the amount of approximately $13,500 on its short term capital gain. This meant that even after paying UBIT the IRA went from $3,000 to approximately $33,000. That is a return of over 1,000% in under 4 months, or an annualized return of over 4,000%! This client will obviously have an easier time making money with her $33,000 Roth IRA than she could have with her $3,000 IRA. Since this was a Roth IRA, no more tax will be owed on this income if it is distributed as a qualified distribution after age 59 ½ or from any other income generated in this IRA from investments that are not subject to UBIT. Ignorance of the tax law is no excuse. You can find out more on this topic by reviewing IRS Publication 598, or by visiting with your tax advisor. After analyzing a transaction, you may come to the conclusion that paying UBIT now in your IRA may be the way to financial freedom in your retirement. Like I often say, “UBIT? You bet!” The information contained in this article is not intended to be tax or investment advice. Strategy #2 – Purchase, Rehab and Resale of Real Estate. In this case study, our client decided not to hold onto the real estate purchased with his IRA. The client received a phone call one evening from an elderly gentleman who said he needed to sell his home quickly because he wanted to move to Dallas with his son. After a quick phone conversation, it was clear that the price the seller wanted was a bargain even considering the needed repairs. Our client dropped what he was doing and immediately headed over to the seller’s house with a contract. The buyer on the contract was our client’s IRA, and of course the earnest money came from the IRA after the client read and approved the contract and submitted it with a buy direction letter to Quest Trust Company. They agreed on a sales price of $101,000. Approximately $30,000 was spent rehabbing the property with all funds coming from the IRA. The property was sold 6 months later for $239,000, with a net profit after sales and holding expenses of $94,000! Strategy #3 – Purchase and Immediate Resale of Real Estate (Flipping). The previous two examples show the tremendous power of buying real estate for cash with a self-directed IRA. However, both of these strategies require a significant amount of cash in your account. How else can you invest in real estate if you have little cash? One of our clients was able to put a commercial piece of vacant land under contract in his Roth IRA. The sales price was $503,553.60 after acreage adjustments. Using his knowledge of what was attractive for a building site, our client was able to negotiate a sales price to a major home improvement store chain for $650,000. On the day of closing Quest received two sets of documents, one for the purchase of the property for $503,553.60 and the other for the sale of the same property for $650,000. After sales expenses, the IRA netted $146,281.40 from the sale with only the earnest money coming from the account! A word of caution in this case is that if property is flipped inside of an IRA the IRS may consider this to be Unrelated Business Taxable Income (UBTI), causing the IRA (not the IRA owner) to owe some taxes on the gain. Even if taxes had to be paid, it is hard to argue that this transaction was not beneficial to the IRA and ultimately the client! It should also be noted that in this situation everyone involved in the transaction was aware of what everyone else was doing, so there was no “under the table” dealings. Strategy #5 – Using the Power of Debt Leveraging. One of my favorite true stories of building wealth in a Roth IRA involves purchasing property subject to a debt. If an IRA owns debt-financed property either directly or indirectly through a non-taxed entity such as a partnership or LLC taxed as a partnership, profits from that investment are taxable to the same extent there is debt on the property. One of our clients used her knowledge of real estate investing and what she learned from a free Quest educational seminar to tremendously boost her retirement savings. After noticing a large house in downtown Houston which was in bad shape but in a great location, our client tracked down the owner in California who was being sued for approximately $97,000 in delinquent taxes on the property. She negotiated a deal with the seller for her Roth IRA to purchase the property for $75 cash subject to the delinquent taxes. With closing costs her Roth IRA’s total cash in the transaction was only around $3,000. Within 4 months she was able to sell the property for a profit to her Roth IRA of $43,500! Because the property had debt on it and because her Roth IRA sold the property for a short term capital gain, the taxes on the profit were approximately $13,500. Still, using the power of debt leveraging her Roth IRA was able to achieve a 1,000% return in less than 4 months even after paying Uncle Sam his share of the profits! Our Annual FRIGHT NIGHT is Back! If you have been to one of our Fright Night events, you know how much fun there are! This is our opportunity to say THANK YOU to both Quest Clients and non-clients. Our Annual event will be the biggest and best we’ve ever had. We’ve rented the swanky Bell Tower to host this years Fright Night and our entire staff will be in attendance. This is a great opportunity to network with Quest Staff, Quest Clients, and other investment professionals! And the best news is…… it’s FREE to attend! Don’t miss this years FRIGHT NIGHT as it only comes once a year. Just a few pictures from our Fright Night event last year! 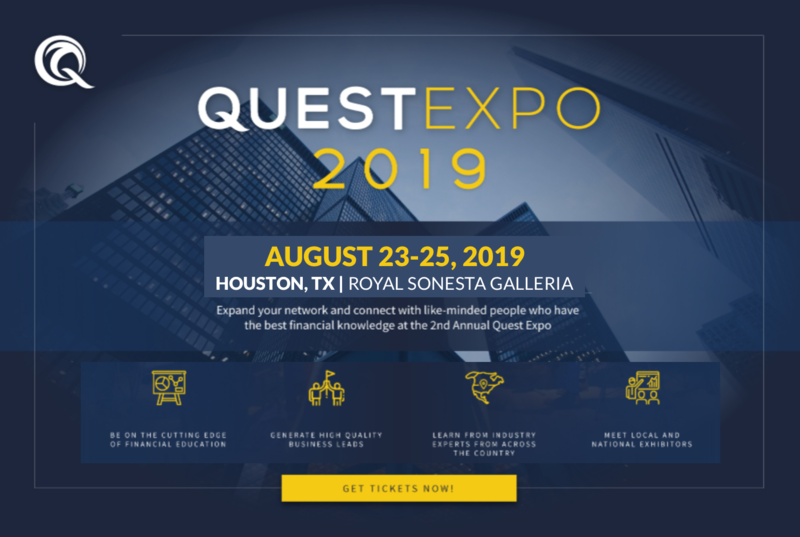 Quest Trust Company, Inc. will be Sponsoring & Educating at the Following Events! See what’s going on in your town! 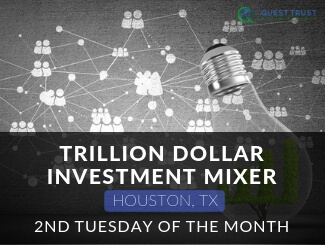 Quest Trust Company Houston Office. Quest Trust Company CEO, Nathan Long, speaking on the Liberty Reak Estate Advisors Radio Show from 3-4pm on KTEK 1110. Realty Round Up 2013: Racing into the Future at the Palmer Events Center. Quest Trust Company President H. Quincy Long and CEO Nathan Long are bringing webinars back! The process of opening a self-directed IRA with Quest Trust Company, Inc. is a very simple process. Just complete the application (Get your application here!) or contact one of our world famous IRA Specialists at 800.320.5950. The Individual Retirement Account will be established within approximately 24-48 hours of receiving the properly filled out application. What are the different ways I can fund my Quest Trust Company Account? Rollover/Direct Rollover : Rollovers can be done from employer plans or other IRAs. To avoid taxes or penalties, make sure the rollover is done within 60 days from the time you took the distribution. Transfer: Transfers can be done to move funds over from like accounts. If you have an existing IRA at a different custodian, we can move the funds (cash & privately held assets) via transfer. Deposit: Your IRA can be funded via annual contributions. All un-invested funds are FDIC insured up to $250,000. All investments carry risk including loss of principal. For more tips on doing your due diligence, click here. What Fees Will I incur with my Self-Directed IRA? Who can I name as a Beneficiary to my IRA? .A beneficiary can be any person or entity the owner chooses to receive the benefits of a retirement account or an IRA after he or she dies. Beneficiaries of a retirement account or IRA must include in their gross income any taxable distributions they receive. Will My Will or Trust Override Who I list As My Beneficiary? Your will or trust will not override what is named on the beneficiary designation of your IRA. The only time a Will would control a non-probate asset is if no beneficiary is designated or the estate is named as the beneficiary. When Does My Spouse Need to Sign the Beneficiary Form? If you do not list your spouse as 100 percent primary beneficiary AND you live in a community property state, your spouse must sign the spousal consent section on our Beneficiary Form. If you live in Arizona, California, Idaho, Louisiana, Nevada, New Mexico, Texas, Washington or Wisconsin and you have named your spouse as 100% Primary Beneficiary directly by name, your spouse does not need to sign the “Spousal Consent” signature section. Note: If you are naming a Trust 100% Primary and your spouse is the trustee, your spouse does need to sign. If you do not live in Arizona, California, Idaho, Louisiana, Nevada, New Mexico, Texas, Washington or Wisconsin; regardless of what your beneficiary is, you do not need to have your spouse sign the “Spousal Consent” signature section. What does Quest Trust Company, Inc. do? 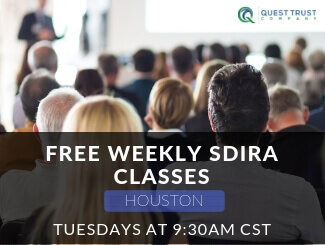 Quest Trust Company, Inc. (www.QuestIRA.com) is a third party administrator of self-directed IRAs in Houston, Austin, and Dallas, Texas, as well as Mason, Michigan. Quest Trust Company, Inc. is the leading provider of self-directed retirement account administration services. Quest Trust Company has been in business since 2003 with over $600MM in assets under management. As a neutral party, Quest Trust Company does not offer any investments and therefore has no conflicts of interest with what our clients want to do with their IRAs. Quest allows you to be in total control of your retirement wealth. Who is H. Quincy Long and why do I care? What is the difference between a “self-directed IRA” and a regular IRA? There is no legal distinction between a “self-directed IRA” and any other IRA. The difference is simply this: Quest lets you take control of your retirement by letting you invest your IRA in what you know best. There are 2 different sets of rules that govern what you can do with your IRA. First, there is the Internal Revenue Code, which has surprisingly few restrictions. Second, there is your account agreement with the custodian. With most custodians you are restricted in the type of investments you can buy in your IRA. Quest allows you the maximum amount of control and flexibility. Almost anything that can be documented can be held in your Quest self-directed IRA. Which types of IRAs does Quest Trust Company offer? All of our plans are self-directed, and all of them can hold the same type of non-traditional assets, such as real estate. Roth and Traditional IRAs – $5,500 for 2013 (kept the same for 2014) plus $1,000 catch-up if you are age 50 or over by the end of the year. SEP IRAs – 25% of your wages (or up to 20% of your net earnings from self-employment) up to a maximum of $51,000 for 2013 and $52,000 for 2014. Contributions can be made up to the employer’s tax filing deadline, including extensions (if you are self-employed, you are the employer). SIMPLE IRAs – $12,000 salary deferral plus $2,500 catch-up if you are 50 or over for 2013 and 2014 plus up to 3% of your salary matched by your employer. Profit Sharing/401(k)s – $17,500 in salary deferral for 2013 and 2014, plus catch-up deferral of $5,500 if you are age 50 or older by the end of the year plus 25% of your wages (or 20% of your net earnings from self-employment) up to a maximum of 51,000 ($56,500 including catch-up contributions) for 2013 ($52,000, or $57,500 including catch-up contributions for 2014). Coverdell ESAs (formerly Education IRAs) – $2,000 per year until the child is age 18. Health Savings Accounts (HSAs) – $3,250 for individual coverage in 2013 ($3,300 for 2014) and $6,450 for family coverage in 2013 ($6,550 for 2014) plus $1000 catch-up for 2013 and 2014 if you are over age 55. What kinds of investments can be made in an Quest Trust Company self-directed IRA? It should be made clear that you are not taking a distribution to purchase these assets. All assets are purchased within the IRA, and all profits stay in the IRA! As a real estate professional, how can knowledge about self-directed IRAs put money in my pocket now? For those of you who are investors, you can make other people aware that they actually have more money to invest in real estate than they thought since they can use their IRAs to buy real estate. In other words, your knowledge of self-directed IRAs can increase your pool of eligible buyers for your properties. Also, you can help others transfer their retirement funds into a self-directed IRA, then you can borrow those funds to make your own investments – in other words, you can create your own private bank! Finally, you can make your own retirement wealth grow with your knowledge and experience in real estate by buying and selling through your own self-directed IRA. Is it really legal to buy real estate in your IRA? Yes, absolutely! The Internal Revenue Code does not tell you what you can do with your IRA, only what you cannot do. Besides restrictions on purchasing life insurance and most collectibles in your IRA, nearly everything else is fair game. Unless your IRA is self-directed, however, your custodian may not allow investments in real estate. How fast can Quest Trust Company purchase an investment? We pride ourselves in our fast processing time of 24-48 hours. Please note that our processing begins when we have received the completed Direction of Investment form as well as any supporting documentation (example: properly vested sales contract). How can I take funds out of my IRA to buy Real Estate, without having to pay taxes and penalties? When using your IRA for the purposes of purchasing Real Estate, you are not actually taking the funds out. Similar to how your IRA can purchase an asset of a stock, your IRA can also purchase an asset of Real Estate. Quest Trust Company specializes in helping our clients purchase RE through their retirement accounts. What are the differences between buying real estate personally and buying real estate with my IRA? b) Funds- When your IRA is used to purchase an asset, the funds must come from the IRA. This includes any expenses that are related to the investment. Likewise.,, any gains or earnings must go back to the IRA. c) Signatures- Because investments are made in the name of the IRA, Quest Trust Company is actually the one that signs the documents. Can my IRA purchase Real Estate I currently own? No. Although the IRS has very few restrictions on the types of investments which are permissible in an IRA, there is a list of “disqualified persons” who are prohibited from dealing with your IRA or benefiting from its investments. The list of disqualified persons includes you, your spouse, your parents, your children, their spouses, certain business partners and key employees and persons providing services to your plan, among others. Interestingly enough, the definition of disqualified persons does NOT INCLUDE non-lineal descendants or ascendants, so if the transaction is an arms length transaction your IRA may be able to transact business with your brother or sister, aunt or uncle, cousins, etc. However, you should be aware that there is an element of danger in transacting business with any person in whom you may have an interest which affects your best judgment as a fiduciary of your IRA, as this could be considered to be a prohibited transaction. Are the gains or income taxable from IRA Real Estate investments? The answer is NO – in most cases. If an IRA buys Real Estate and then sells it at a profit, all income generated while it was held in the IRA and all the gains resulting from sale WILL be either tax-deferred (traditional IRA) or possibly tax-free (Roth IRA), IF the purchases were all cash with IRA funds. However, if the IRA purchased Real Estate that is debt financed, the IRA could be subject to taxation. The tax applied is called Unrelated Debt Financed Income tax or UDFI tax. Can my IRA make loans to others who want to buy Real Estate? Yes, your IRA may loan to any person, as long as they are not a disqualified person. These loans involving Real Estate are generally referred to as Promissory Notes. They are usually secured by the deed to the property that serves as collateral for the loan if the borrower fails to meet the loan obligations. For more Information visit our Promissory notes webpage. Can I partner with my IRA or with other peoples IRAs? Your IRA can always partner with other people individually or with other people’s IRAs. Under certain circumstances you personally may be able to partner with your IRA. However, the burden of proving that you received no impermissible benefit from your IRA’s participation in the investment will be on you if the IRS ever questions the transaction. The transaction still must be an arms-length transaction, and the investment remains subject to the same restrictions as if the entire investment were in your IRA. In general it is better to separate your IRA’s investments from your own investments. I only have a small IRA. How can I buy real estate? There are at least 4 ways you can participate in real estate investment even with a small IRA. First, you can wholesale property. You simply put the contract in the name of your IRA instead of your name. The earnest money comes from the IRA. When you assign the contract, the assignment fee goes back into your IRA. If using a Roth IRA, this profit is tax-free forever! Second, you can purchase an option on real estate, which then can be either exercised, assigned to a third party, or canceled for a fee. Third, you can purchase property in your IRA subject to existing financing or with a non-recourse loan from a bank, a hard money lender, a financial friend or a motivated seller. Profits from debt-financed property in your IRA may incur unrelated business income tax (UBIT), however. Finally, as mentioned above, your IRA can be a partner with other IRA or non-IRA investors. Can an IRA buy debt-financed property? Yes. Any debt must be non-recourse to the IRA and to any disqualified person. An IRA may have to pay UBIT on its profits from debt-financed property. In general, taxes must be paid on profits from an IRA-owned property that is debt-financed, including profits from the sale or disposition of the property, in the same proportion that it had debt. For a simplified example, if the IRA puts 50% down, then 50% of its profits above $1,000 will be taxable. Although at first this sounds terrible, in fact leverage can be an extremely powerful tool in building your retirement wealth. The same leverage principle applies inside or outside of your IRA. You can do more with debt-financing than you can without it. Can I use my IRA funds to buy a foreclosed property? Yes, IRAs can indeed purchase foreclosures. However, you will want to be aware of the specific foreclosure purchase process. Contact our office for more information! If I am a Realtor, can I receive a commission for property bought or sold by my IRA? No, for the same reasons stated in the prior answer. Anything that creates a possible conflict of interest with your IRA is likely to be a prohibited transaction. Why take money that is tax-free or tax-deferred and pay taxes on it now anyway? Can I cut the funding check directly to the seller and then get reimbursed? No, because this is an IRA owned property, all of the funds must come directly from the IRA. You may complete a Direction of Investment form that will instruct Quest Trust Company as to where to send the funds. Can I receive a fee for managing property owned by my IRA? No. The prohibited transaction rules are intended to make sure that you receive no current benefit from your IRA other than as the beneficiary of the IRA. Investments must be arms-length and exclusively for the benefit of your IRA. Can I live/work/vacation in a property my IRA owns? No, this would be considered a prohibited transaction. For a complete guide to Prohibited Transaction, click here. Can I collect the rents for my IRA rental property? Yes and No. You can have the renters forward the rent checks to you, BUT made payable to your IRA. They cannot be made out to you, nor can you deposit them, even if you plan to reimburse your IRA. If you do collect the rent checks, make note, and forward the check over to Quest Trust Company.